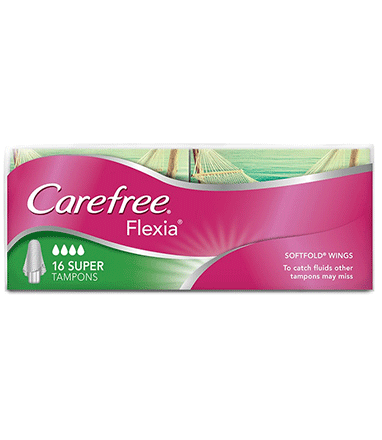 CAREFREE® FLEXIA® Super Tampons catch fluid that other tampons might miss. The unique SOFTFOLDS® wings adapt to your body and attract fluid to the inner core of the tampon to help prevent embarrassing leaks. And when it’s time for bed, you’ll get 8 hour protection while you sleep* so you can wake up feeling clean and fresh. *CAUTION: A tampon should never be left in for more than 8 hours. For night use, change the tampon before you go to bed and first thing in the morning; please read the enclosed leaflet in your CAREFREE® FLEXIA® Tampon pack for usage instructions.